(CNSNews.com) - Sen. Marco Rubio (R-Fla.) says he has no problem with the Florida vote recount, which is governed by law. "I have a problem with law-breaking," Rubio tweeted Tuesday night. "And a problem with lawyers trying to steal an election by looking for a judge who will ignore the law." "Imagine if NFL team was trailing 24-22 but in final seconds hits a 3 pt kick to win. Then AFTER game, lawyers for losing team get a judge to order rules changed so that last second field goals are only 1 point. Well that’s how democrat lawyers plan to steal #Florida election," he wrote. "For example," he continued, "Florida law requires that the voter signatures on mail ballots match the signature of the voter. But Dem lawyers are asking a judge to throw that law out & force Florida to count ballots with signatures that don’t match the voter signature on file." 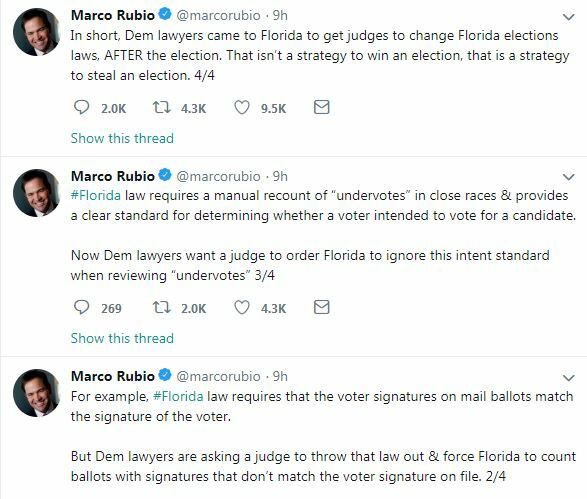 Rubio also noted that "Florida law requires a manual recount of 'undervotes' in close races & provides a clear standard for determining whether a voter intended to vote for a candidate. Now Dem lawyers want a judge to order Florida to ignore this intent standard when reviewing 'undervotes.'" 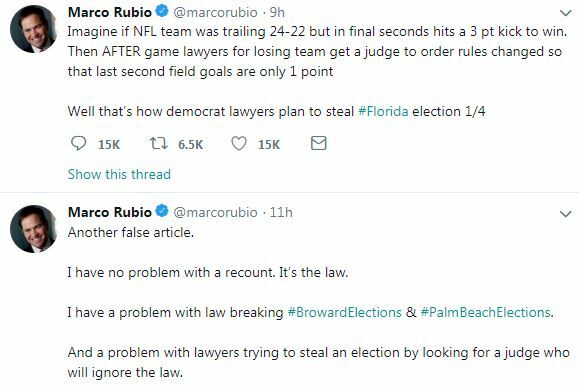 "In short," Rubio concluded, "Dem lawyers came to Florida to get judges to change Florida elections laws, AFTER the election. That isn’t a strategy to win an election, that is a strategy to steal an election." I believe the law hasn't been followed from the beginning. You know, those early votes, the last time they were cast was the Sunday before the election. And by law, those are supposed to be downloaded and sent to the state by 7:30 p.m. on the night of the election. And then you have to process the absentee ballots, the mail ballots, that have come in before that time. And then there's always some that come in Monday and Tuesday before the election. Those should be (processed) shortly thereafter. They didn't follow any of that. There's always additional votes added to every country, because people are voting from overseas or because you haven't fully processed all the ones you that you had by 7:30. But you're supposed to update that every 45 minutes. They didn't do that. Rubio noted that Broward County's vote count included at least 19 people who were disqualified from voting by their own canvassing board, and the canvassing board only found out about those 19 when Broward elections officials were caught counting the disqualified ballots. “And we don’t know how many others that may have happened (to),” Rubio said. He also noted that Broward County didn’t start its machine recount until Tuesday morning, while other counties are almost finished. “So it’s irregularity after irregularity. And as far as stealing is concerned, let me just make this one point on that,” Rubio continued. "The election lawyers are not coming to Florida to make sure every vote is counted. The reason why election lawyers get involved is to make sure as many votes as possible for their client is counted; and as many votes as possible for their opponent is disqualified. “And when you have an election office this incompetent, and this law-breaking, it creates enormous opportunity for those sorts of arguments to be made, and suddenly the elections are decided by a judge or by lawyers, not by voters, the way they're supposed to be."